Goalscorer Colby Bishop takes on his man. Picture by Matt Joseph. Jack Edwards (right) heads the ball away. Picture by Matt Joseph. 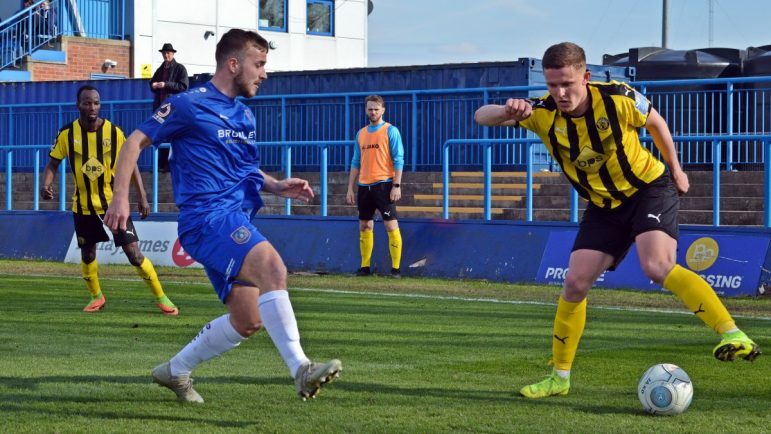 COLBY Bishop’s late equaliser handed Leamington a point at the Tameside Stadium against Curzon Ashton, after a 1-1 draw which inches the Brakes a step closer to National League North safety. The Brakes had fallen behind to Cameron McJannett’s goal just before the quarter-of-an-hour mark looked like being enough to sneak the win for the hosts – before Bishop’s late intervention. Boss Paul Holleran praised the improved second-half performance of his players and felt they could feel hard done by to only leave Greater Manchester with a point. “At half time we made a few tweaks and I thought in the second half we were excellent. “As much as Curzon were the better side in the first half – we were the better side in the second. “I thought we were more patient in the build up, we pressed the game better, created some really good chances, and the subs made a big impact, as they did last week. Both sides were reduced to ten men either side of Bishop’s leveller, which Holleran thought was harsh, but ultimately did not take away from a promising performance. “I think in the spirit and the manner the game was played in, those decisions could have been managed differently, but overall I’m absolutely delighted. The Brakes were unchanged from the same starting 11 that had beaten Ashton United a week before, with Tom James replacing the injured Sam Wilding on the substitutes bench being the only change. 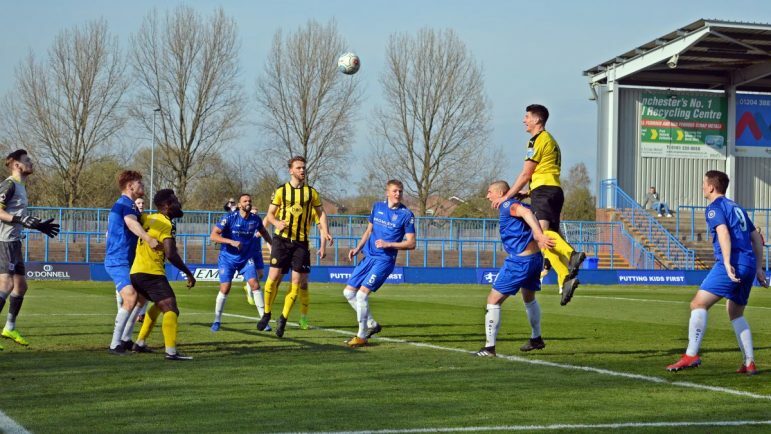 Curzon Ashton were efficient in getting the ball moving forward and spraying passes all over the pitch, as the Brakes struggled to gain a foothold in the game. A Lewis Reilly header was touched onto the bar by Tony Breeden, before left-back he was forced to atone for his own error when scuffing a clearance to McJannett – who drilled the ball goalwards from 35 yards out that had to be pushed over. Ryan Brooke’s header went even closer for the hosts, with the ball striking the inside of the post and bouncing out. The hosts eventually capitalised on their early pressure to open the scoring. McJannett was on hand to lash home from 20 yards, after James Mace had cleared Breeden’s parried save, firing the ball into the top-right corner of the net. Curzon continued to trouble the Brakes defence and Breeden’s goal, but somehow the visitors were able to restrict the hosts to just the one goal. Bishop crashed a header onto the bar just before half-time, which was almost a catalyst for their much improved second-half. Jack Edwards had the ball in the net for Leamington, meeting Bishop’s header into his vicinity to direct the ball into the net, but the offside flag cut short any celebrations. A red card for defender Jamie Hood in the final ten minutes of the game looked to have killed off any chance of a revival by the Brakes, after he was deemed to have questioned the officials too forcefully. What hadn’t appeared in the script however, was Bishop’s cushioned header high into the roof of the net to draw Leamington level just two minutes later – claiming his 23rd goal of the season in the process. Even more remarkably was a second red card of the game that followed a couple of minutes after the goal – this time being shown to Ryan Shenton. With the sides now level in numbers on the pitch again, the Brakes were most likely to go ahead, and almost did when Reece Flanagan bore down on goal, but the Curzon goalkeeper was just a yard quicker to claim the ball. Jack Lane went close with a deflected strike from 20 yards out, which Mason did well to parry, but it was the final action of the game as both sides claimed a point. The Brakes currently sit 11 points from the drop zone with four games left to play, effectively sealing their survival, although one more win would make sure of their National League North status. They next host Alfreton Town at the Phillips 66 Community Stadium on Saturday (3pm), who sit in 14th, with a Brakes win closing the gap on the Derbyshire club to just a point.